Need to know more about medical marijuana? Managing Brokers: Like it or not, medical marijuana is coming to your community, and the January issue of IAR’s D.R. Legal News will supply you with enough facts to get you started. 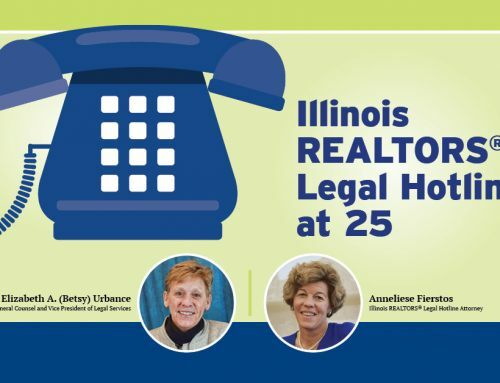 Lisa Hartzler of Sorling Northrup Attorneys, and Betsy Urbance, IAR Legal Hotline Attorney, summarize information they gathered for the Dec. 18 Legal Webinar about medical marijuana in Illinois. Registered patients will have alternative ways to use medical marijuana, such as tea or pills. Registered patients who rent a property may not legally smoke indoors if the landlord has a smoke-free policy for the leased property. Medical marijuana must be sold at least 1,000 feet away from schools, day care centers and residential areas. Medical marijuana must be grown at least 2,500 feet away from schools, day care centers and residential areas. D.R. Legal News is a monthly newsletter distributed to Managing Brokers who are IAR members.